The new ZWILLING SharpBlock from the Gourmet series is equipped with KIS technology - and therefore much more than just a knife block: while other blocks merely protect the knives, the ZWILLING SharpBlock can also maintain their quality and sharpness by sharpening your knives. 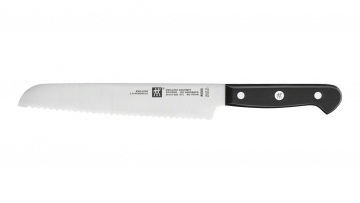 Sharp knives not only make kitchen work easier, but are also safer. You avoid slipping and need less power to cut. Regular sharpening of the blades is therefore extremely important. 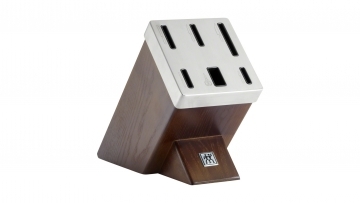 The ZWILLING SharpBlock takes over this work for you from now on. Whenever you remove or fold back a knife, it is automatically sharpened. The secret behind the KIS technology are ceramic sharpening stones, which are inserted into the pockets of the smooth-edged knives. 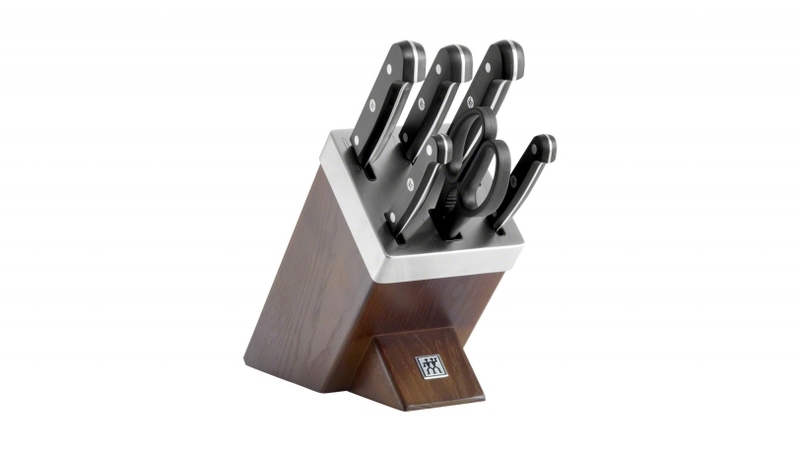 Each compartment is designed for a specific knife, which sharpens each blade at the ideal angle. This way, your knives stay extremely sharp for a long time. The ZWILLING SharpBlock not only does a good job, it also looks good and beautifies every modern kitchen. 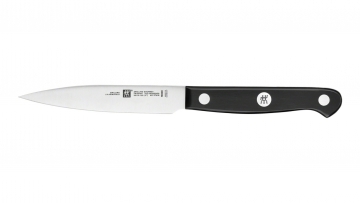 The SharpBlock is ideal for ZWILLING Gourmet series knives, which are already included. 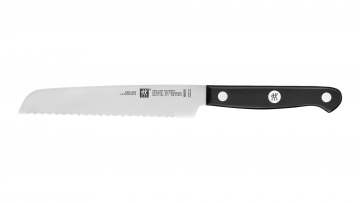 The kitchen knives from the series Gourmet by ZWILLING are characterised by extremely resistant, ice-hardened blades, which are also resistant to corrosion. 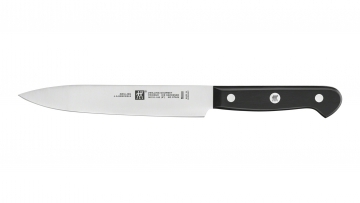 The plastic handle is designed in the classic three-rivet design and ergonomically shaped. Multi-purpose shears Paring knife Utility knife Slicing knife Chef's knife Bread knife Self-sharpening knife block, ash wood, 7-pcs.